For almost 30 years, Henderson Garage Door has been the leading experts in the sale and service of garage doors to the Kemah TX area. We've been a family-owned and operated company all this time, and plan on continuing this legacy for years to come. While a lot has changed since 1989, our commitment to fine products and high quality service has remained the same. 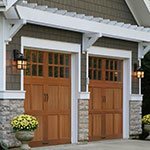 Whether your garage door is need of repair or you need an entirely new door, Henderson is the company that you'll want to trust. We feature a 6000 square foot warehouse with a fully operational showroom, so you'll know what you're getting when you work with us. We take our reputation very seriously, which is why we work with uniformed, hourly-paid employees and not outside sub-contractors. Call us today to learn how the Henderson family can help you!